Heyworth Public Library District library cards are free to residents who live in Randolph Township and the northwest portion of Downs Township. (Visit Getting a Library Card for more information.) HPLD library cards may be used at any library in RAILS (Reaching Across Illinois Library System). This service area includes Normal Public Library, Bloomington Public Library, Mt. Hope/Funks Grove Library, and the Vespasian Library in Clinton, IL among many others. If the Heyworth Public Library doesn’t have an item (book, periodical, movie, or music CD) that our customers need, we can usually obtain it from another library through interlibrary loan. 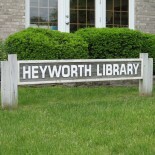 There’s something for everyone at the Heyworth Public Library! We’re not just about books; visit our website for all our services, materials, and programs. You’re sure to find something to spark your interest! Our friendly staff is always willing to help in your search for materials. Heyworth Public Library District is member of RAILS (Reaching Across Illinois Library System) and RSA (Resource Sharing Alliance).